Since our last update was many months ago, I thought it would be a good idea to send a message to our loyal followers of this blog and briefly let you know how our project is progressing. 2013 was a big year for MEMSAP, although it has had a different flavour from previous years. We have now entered our final year of our major grant from the Australian Research Council and that means it has been a year to evaluate what we have achieved so far, focus on analysis of recovered materials rather than simply doing more fieldwork, and begin to shape our plan for the next phase of the project. Most people think of archaeological work as exciting fieldwork in remote places. Doing fieldwork in Karonga is certainly exciting, and it does feel remote…though of course we have never been too far away from a nice hard mattress on the floor or a beach bar! But in all seriousness, a very important aspect of archaeological work that is often bypassed in its public image is the translation of all that time, money, and effort expended during fieldwork into a final product. That product can take many forms – analyses of recovered materials, technical reports, academic publications, or distribution of information to the broader community. Remember: the goal of all of this work is to understand something about our past, and in the context of these very old deposits that is a past shared by all humankind. MEMSAP has now begun to produce more of the final products that allow us access to that knowledge, and that to me is very exciting indeed. If you have a look at our “Project Output” page you will see that we have published one more paper this year and presented eight papers or posters at professional conferences. We also have a placeholder announcing three papers we hope will be accepted for publication in 2014. All three of those articles have already been through a peer-review process by our colleagues in archaeology and we have received positive reviews for all of them. Therefore, I think there is a good chance our next update will contain full citations. In terms of future publications, there is much more – oh so much more! – to report that there will be no shortage of work to write up in the coming years. Our team is currently analysing lithic assemblages, OSL samples, sediment samples, phyolith and pollen samples, archaeomagnetic samples, and cosmogenic nuclide samples. These data will be used to keep building toward our goal: a long chronology of human behavioural change in northern Malawi, and an understanding of its environmental context. The image below shows the results of some spatial analysis on our Mwanganda’s Village artefacts: the large coloured dots represent artefacts that fit back together again (thus saying something about where past humans were making different artefacts at that site), while the small black dots represent the locations of artefacts that do not fit back together. The layers are a snapshot of our 3D GIS and show how we have been able to do virtual site reconstruction with our spatial data. One thing you will notice is that our eight conference presentations this year have been first-authored and delivered by five separate researchers. This truly shows the scope of what our project has become since its first simple reconnaissance year in 2009. Sometimes it may not be apparent from the outside just how many people have actually contributed to a project like this nor how important their contributions are. So take my word for it: the hard work of our project members is what makes MEMSAP viable, and I am lucky to be part of such a skilled and dedicated team. Not everyone has their biographies listed under our “Who We Are” page and some entries need updating, so until I can get those posted I just wanted to say a general thank you to everyone who has been involved in this project in one way or another over the years. One of the elements of MEMSAP that has been especially rewarding has been our ability to incorporate our research project into the inaugural UQ Archaeological Field School, and vice-versa. This course has now run twice since 2011, and seen participation from thirty foreign and nine Malawian undergraduates, four foreign and three Malawian postgraduates, and five members of the Malawi Department of Antiquities. We already have a full enrolment from UQ slated for 2014, and we are looking forward to introducing them to archaeological fieldwork in the exceptionally rich localities in Karonga. Maybe we can even get some of them to give us a blog post (hint hint)! Now looking to the future, the next phase of our research will be based on survey and test-pitting rather than more large excavations. You might be wondering, “Hey…aren’t you supposed to be doing that sort of archaeological reconnaissance BEFORE doing all those big excavations you’ve already done?” The answer is yes! But in our case all our excavations have taken place around the immediate vicinity of the town of Karonga, after their own reconnaissance phase in 2009. Also, thanks to the work of J Desmond Clark and colleagues in the 1960s we already had an idea of what to look for and where to find it. Where we will be going now is effectively archaeological terra incognita. Over the years we have begun to send our feelers out beyond the boundaries of Karonga town, and into neighbouring river catchments that also have rich, but undocumented, archaeological deposits. You were able to see some of this work proceed this year as Victor de Moor, James Flitter, Davie Simengwa, and Oris Malijani made their way into new places in June 2013. This work has shown us that whatever results we have so far near the town of Karonga are not representative of past human behaviour across the greater landscape. The availability of stone materials is different, and there were different forms of stone artefact reduction in use. To understand how our excavated assemblages fit into the bigger picture, we have to begin to extend our research both physically and conceptually into other parts of northern Malawi. We hope that through this blog you will be able to join us as we do so starting next July with work in three of the more southern river catchments in the Karonga District, including at the handaxe locality of Sadala South. 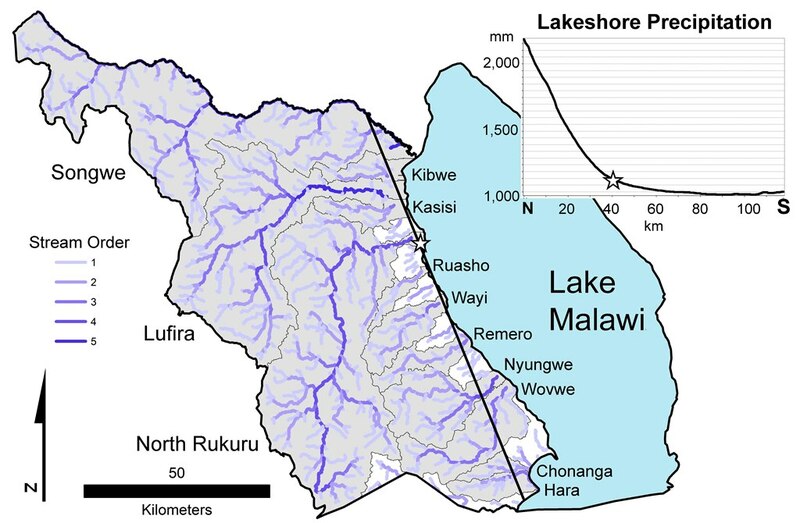 The image below is from one of our submitted papers, and shows the different river catchments in the Karonga District and where we will have to travel during our future work. Thank you again to everyone for following along and being a virtual and/or actual part of this project. From MEMSAP to you, here is wishing everyone a very happy festive season and a productive new year!